Nabarangpur-Online: Panchayat Polls: 148 Candidates File Nomination Papers On Day One at Nabarangpur. Panchayat Polls: 148 Candidates File Nomination Papers On Day One at Nabarangpur. The process of filing nomination papers for the upcoming panchayat polls began from Wednesday. On the first day as many as 148 candidates filed their nomination papers. Two Zilla Parishad (ZP) candidates of ruling Biju Janata Dal (BJD) and one from Congress filed nomination before the sub-collector Gopal Swami Naidu. 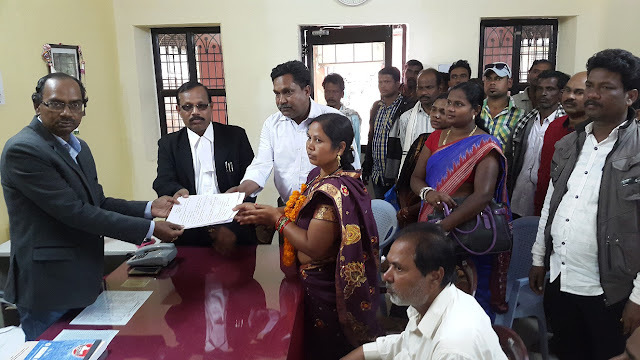 The chairman of Nabarangpur block Bedabysa Bhatra, (BJD) for Nabarangpur ZP Zone-2, and Champabati Muduli for Tentulikhunti ZP Zone-2, while Tulusa Bhatra, of Congress filed nomination for Papadahandi ZP zone-3. While Sarpanch, ward member candidates filed nominations at their respective panchayats, and samiti members at respective block office of the district. The filing of nomination will continue till January 17 the papers will be scrutinized on January 18 and the candidates can withdraw their nominations till January 21. The final list of candidates will be published the same day after 3 PM.